LOS ANGELES, CA (December 17, 2018) – BOOM! Studios today announcedWELCOME TO THE WHEDONVERSE FCBD SPECIAL, an all-new comic book arriving in comic shops worldwide on Free Comic Book Day (May 4th, 2019), with all new stories featuring two of the greatest creations from visionary Joss Whedon (writer/director Marvel’s The Avengers). 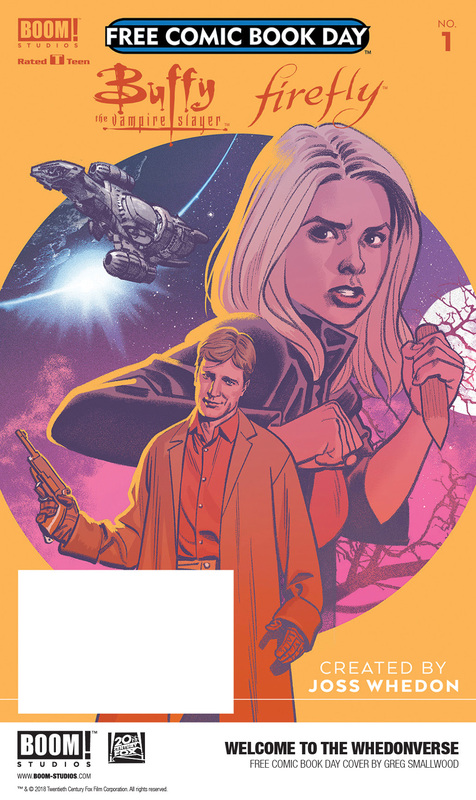 This FREE comic, released in partnership with 20th Century Fox Consumer Products, is the perfect jumping-on point for the “Whedonverse” with all new stories from the worlds of BOOM! Studios’ hit series Buffy The Vampire Slayer and Firefly. First, Captain Malcolm Reynolds and his first mate Zoe Alleyne Washburne have a bond that was forged in blood during the war that shaped the ‘Verse…but when the awful secret at the core of that bond is finally revealed and they’re called to answer, the people who love them are left to pick up the pieces in an all-new story written by Greg Pak. Created by Whedon and set 500 years in the future in the wake of a universal civil war,Firefly centers on the crew of Serenity, a small transport spaceship that doesn’t have a planet to call home. Mal Reynolds, a defeated soldier who opposed the unification of the planets by the totalitarian governed Alliance, will undertake any job — legal or not — to stay afloat and keep his crew fed. Thrust together by necessity but staying together out of loyalty, these disparate men and women are seeking adventure and the good life, but face constant challenges on the new frontier, such as avoiding capture by the Alliance, and evading the dangers you find on the fringes of the universe. And in the second exclusive story, there’s something evil lurking under Sunnydale High School, namely a gateway to a hell dimension that’s been foretold to destroy the world as we know it. Buffy and the gang have mostly got it under control…as long as everything stays exactly as it is, and we mean zero new plot points, no new characters, and absolutely no twists, turns, or misunderstood prophecies. Easy peasy! Writer Jordie Bellaire and artist David López continue the bold reimagining of the groundbreaking mythology that changed pop culture forever. WELCOME TO THE WHEDONVERSE FCBD SPECIAL, featuring a cover by Greg Smallwood (Moon Knight), is the latest release from BOOM! Studios’ eponymous imprint, home to a world-class group of licensed comic book series and ambitious original series, including Lev Grossman’s The Magicians, Mighty Morphin Power Rangers, Planet of the Apes, Abbott, Mech Cadet Yu, Grass Kings, and Klaus. Print copies of WELCOME TO THE WHEDONVERSE FCBD SPECIAL will be available for FREE on May 4th, 2019 exclusively at local comic book shops (usecomicshoplocator.com to find the nearest one). For continuing news on WELCOME TO THE WHEDONVERSE FCBD SPECIAL and more Free Comic Book Day news from BOOM! Studios, stay tuned to www.boom-studios.com and follow @boomstudios on Twitter. And follow Buffy the Vampire Slayer onFacebook, Twitter, and Instagram. WGN America Is Back With New Dog the Bounty Hunter Series, "Dog's Most Wanted"